What’s Wrong with the Dallas Cowboys? Yesterday evening was the last game of the 2013 NFL regular season. It featured the Philadelphia Eagles and the Dallas Cowboys — bitter rivals — in what was a game where the winner was crowned the NFC East division champion. Both teams took very different paths to the game. The Eagles started the season quite poorly, losing 5 of their first 8 games. The Cowboys finished the season quite poorly, losing 3 of their last 4 games (including the game last night against the Eagles). The one win in the last 4 games for the Cowboys was in the game just before last night’s game where the team’s QB, Tony Romo, played through a season-ending injury to lift the Cowboys to victory. As Tony Romo was one of the team’s stars, most people didn’t give the Cowboys much of a chance of winning last night’s game. However, there they were, in the waning minutes of the game, with a chance to win. What happened instead? A mental error. The Cowboys have been making mental errors near the end of the game more frequently than they had been in decades past. More importantly, there have been these mental errors when the game is on the line. Let’s back up for a moment and look at the Cowboys as a franchise. 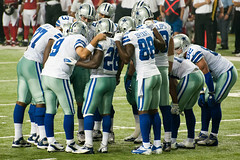 They are one of the most storied football teams in the NFL and certainly one of the most lucrative. In the ’90s, they had what could be called a dynasty when they won the Superbowl in 3 out of 4 years between 1992 and 1995. In the decade of the ’90s, they only missed the playoffs twice (1990 and 1997). In that one decade, they made the playoffs more times than they have in the past 14 years (6 times). What happened? In 2000, Troy Aikman, the star QB of the ’90s for the Cowboys, retired. In the time between Aikman (and Romo), the Cowboys had a potpourri of QBs that I’m sure most people would rather not remember. In 2006, when Romo took over as the starter in the middle of the season, the Cowboys went on to make the playoffs. They went on to make the playoffs in 3 out of the first 4 seasons that Romo was the QB, but haven’t been back to the playoffs in the last 4 seasons. Based on how some of those seasons ended and/or how some of those playoff games ended, it seems evident that Tony Romo is in dire need of a sports psychologist. If we go back to the 2006 season playoff game against the Seattle Seahawks, Tony Romo dropped the ball when the kicker was attempting a go ahead field goal with less than 100 seconds left in the game. Or the playoffs in the next season when the Cowboys were tied for the 2nd best record in the NFL. Tony Romo threw an interception in the end zone with less than 10 seconds to go in the game. Or last season’s final game when all the Cowboys had to do was win and they were in the playoffs — Romo threw 3 interceptions. Last night Romo didn’t play, but if we can look at more than one game this season when Romo threw an interception when the game was on the line (against the Broncos and against the Packers). Because of how the game ended last night, with the Cowboys QB — again –throwing an interception when the game was on the line, I wonder if there might be something else at play here. A couple of years ago, I wrote about some of the problems that the Vancouver Canucks goalie was having in the Stanley Cup Finals and how there might be something else that was affecting play. I wonder if that might be happening with the Dallas Cowboys’ QBs right now. Part of the reason I talked about the success of Troy Aikman and the Cowboys during the ’90s is because I wonder if something changed — energetically speaking — with the “position” of the Cowboys QB. I know that this might sound strange, but it’s an option worth considering. Tony Romo has been one of the best QBs — statistically speaking — since he’s been in the NFL. He’s already thrown for 50 more TDs than Troy Aikman did in his career and Romo has played in 50+ less games. 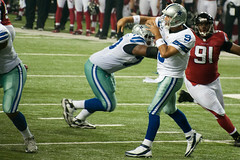 Romo currently has a 95.8 career passer rating. Currently, that ranks him 5th highest — all-time. Assuming Romo is able to recover from his injury, he’ll more than likely pass Troy Aikman on the all-time passing yards list, where Aikman currently ranks 30th. Tony Romo has been a fantastic QB for the Cowboys — statistically. However, when the game is on the line, things haven’t exactly gone his way. As a result, I’m lead to believe that, a) a sports psychologist is in order, and b) maybe there’s something energetically at play that’s affecting the organizational position of “Dallas Cowboys QB.” It might behoove Jerry Jones to call someone who can figure it out. What Will Medicine Look Like in the 22nd Century? Every now and then, I like to watch some old episodes of Star Trek. I should clarify: I watch “The Next Generation.” I’m a little young for the original series. The Next Generation aired during my younger formative years (and how grateful I am for this). I often think that my strong sense of morals has a lot to do with the fact that I was often presented with ethical dilemmas through the vehicle of this show. A few weeks ago, I happened to catch an episode from near the end of the final season: Thine Own Self. One of the two featured plot lines for this episode is Data‘s visit to a ‘primitive’ village. Data, suffering from amnesia, is taken in by this village. Maybe I should back-up and tell you how he got there. Data was sent on a mission to recover some radioactive material from a probe that crashed on the planet. Having suffered injuries during this recovery attempt, Data walks to this village (miles and miles away), carrying a box that says radioactive. As I said, this village welcomes Data — at least for a little while, but I won’t get into all of that. The parts I want to focus on are those that occurred with the town’s healer. Because Data doesn’t know who he is, he is taken to see the town’s healer. Listening to her assessment of Data’s injuries and the like is a real treat. The way the healer reasons that this is causing that because of something unforeseen is just what you might expect from a pre-industrial society. That’s not meant to sound pejorative — societies do the best they can with what they’ve got. I looked and looked for a clip of the healer diagnosing Data or of the healer diagnosing the members of the village (as some of them get radiation poisoning), but couldn’t find it. However, I was able to find a clip of the healer teaching some of the children about the elements. After seeing this episode again, I had to think to myself, what are our assumptions in medicine today that will seem laughable in 100 years. What about in 300 years? What about in other fields? Will we laugh that we ever used to think that we weren’t able to communicate telepathically? What about seeing things at a distance? Will there still be poverty? Hunger? Whenever we start to take ourselves and our assumptions too seriously, it’s important to remember the humble beginnings from which we come.